So today I have been making my book jars. An idea I first saw on Laura’s blog, Devouring Texts and she saw on Alex in Leeds. I made two. The bigger clear one is for my paper books and the little orange one is for my kindle books. To make an extra distinction (and because they’re pretty) I made my paper book options into paper cranes. Basically the idea is for a book jar to be a sort of lucky dip. On each piece of paper is written a book from your to be read pile. Not sure what to read next? Pick a piece of paper and read the book written on that paper. Mine isn’t colour coded like Alex’s, the colours just for prettiness. I think it’s going to give a good chance to those books I’ve had for a long time but somehow never read. I just wish I’d had it during my post Life After Life reading flunk. For fun here’s a tutorial on how to make an origami crane. They’re pretty easy, the only origami I can make actually (although I have managed to make a parrot a couple of times with lots of instruction.). This is the only video I could find that used the exact same method I do- but I’m sure other methods work. I love the origami! Makes it so much more interesting and, of course, pleasing on the eye. Creating a book jar is getting pretty high on my to do list now. It’s such a good idea. Yaaaay! I’m so happy you made one, and I WON’T REST until everyone has a Book Jar! Also thank you for posting the origami tutorial, I’m soooo going to be making some cranes! I like this idea, I keep wondering about trying it but I’d need a big jar if it’s to fit everything on the to be read? I love the paper cranes very clever. I love the cranes! I have so many books on my TBR I can’t do anything fancy with my slips and it’s taking me forever to do it. But I hope it will help get through all those forgotten books. I’m really looking forward to picking my first book from it, but I have a couple of challenge books to read first. 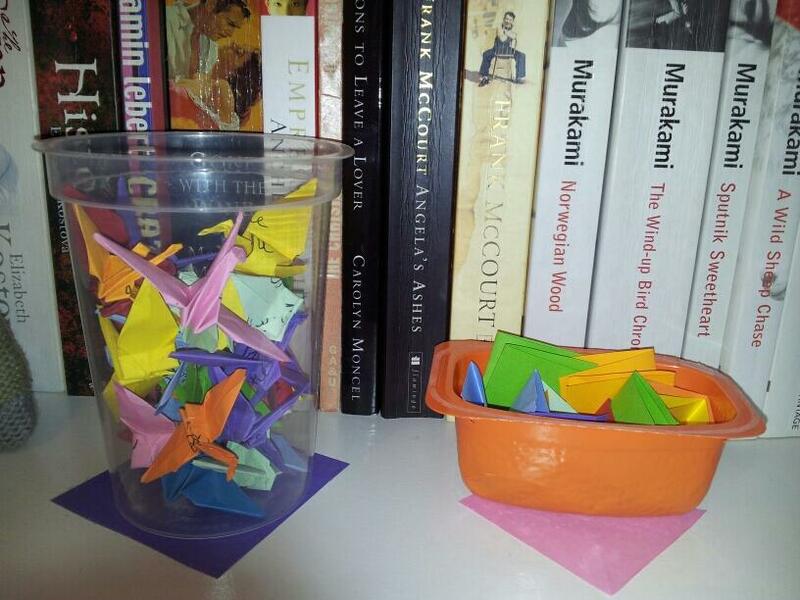 Yeah, for a blogger my TBR pile is pretty small, and the cranes took me long enough! Will be easier now I’ve done what I have though, I’ll only have to do a few more at a time. The canes probably take up more space than little slips of paper, but yeah you might need a bigger pot. Alex fitted over 300 into hers I believe and the jar doesn’t look too big. lol, maybe I should have picked a shelf with a wider variety of books on it! lol yes everyone should make one. I hope you get on well with the cranes, I can’t make them quite as perfectly as the video but mine have character! Awesome idea! I should do this for books I really must read soon.